A 25-acre Certified Organic farm, specializing in salad greens, cut flowers, and select vegetables. 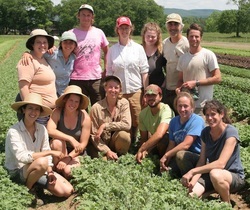 Old Friends Farm is guided by their Holistic Goal, which you can read ﻿here ﻿. They lease land from the Open Field Foundation at Bramble Hill. Old Friends Farm can be found at the Amherst Farmers' Market on Saturdays, and the Northampton Tuesday Market . 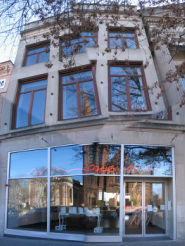 You can also find their salads, vegetables, syrups and flowers at restaurants, stores and florists in the Pioneer Valley and beyond. Summer camp at the Hitchcock Center. The Center's mission is to foster a greater awareness and understanding of our natural world and to develop environmentally literate citizens. 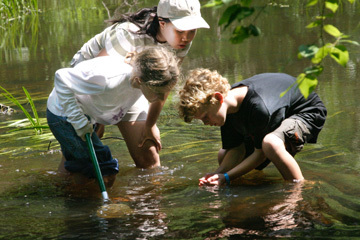 They offer natural history programs for people of all ages and backgrounds. They are committed to excellence in science education and work extensively in school systems throughout western Massachusetts training educators to be more effective science teachers. Available Potential Enterprises, Ltd. is located across the river from Bramble Hill Farm in Northampton. Founding Director Gordon Thorne has been, for over 30 years, interested in maintaining spaces for artists to work, much as he has been interested in preserving farmland for farming. A.P.E. artists have created site specific work at Bramble Hill Farm, and Farm personnel have showcased work in the A.P.E. space. Both organizations are by intent linked in their missions and values, despite the surface differences in their enterprises. Harvesting cabbage at Brookfield Farm. to create and support responsible agriculture by furthering all aspects of sustainable, biodynamic, organic, or other environmentally, economically, and spiritually healthy agricultural techniques.